A couple of coeds that I attended high school with were able to purchase front row seats and obtained one for me out of the goodness of their hearts! To say that I was surprised would be an understatement! 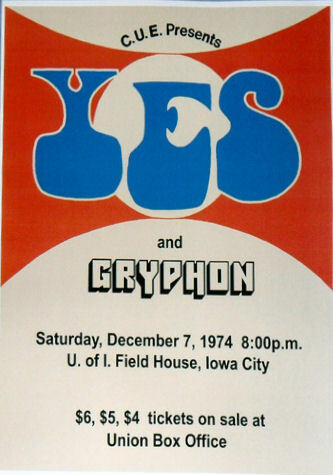 This was my 3rd yes concert and with front row seats it almost matched my first concert in Sept of 1972. I was a little disappointed in that the group had turned to theatrics at the expense of the music with the giant set. If I'm correct, I think it was similar to the set they used on the 'Tales' tour, but my memory has faded a bit. Also, I was disappointed because Patrick Moraz was with them instead of Rick Wakeman, but in hindsight it didn't matter. The experience was great in that it was an enjoyable evening in a great college town at a relativly small venue. Still, the freedom of fesitival seating was absent that allowed for the best concert experience. The first "real" concert I ever attended. I'm not counting the Grassroots. Yes was mesmerizing, overwhelming, and far beyond my comprehension. What a show to pop my cherry! The visuals and effects were as memorable as the music, which was incredible. I wore my shirt from the concert until it literally fell apart. In 30-40 shows from other bands since, none ever transfigured me as this one did! Wish I could relive this one!!! This was one of the first "Big Name" concerts that I ever attended, in fact I still have the ticket stub. And while I was in a slightly "altered stated" at the concert, I do have a couple of vivid memories. One being of the keyboard player - Patrick Moraz. As a kid I took piano lessons for many years, so I watched Patrick very closely. Then in '78 or '79 I went to a Moody Blues concert in Ames, and there he was again - way too cool. Almost deja vu all over again. Thanks for the site. It's always fun seeing the play lists of concerts that I have attended.